It was bitterly cold last night as my wife and I sat in the stands to watch my son’s varsity lacrosse game against the cross-town team. Many of these kids had competed on the same junior league teams growing up and as a result there is a fierce competition when they play against one another. Pride was on the line and the hitting was hard, the emotions high. 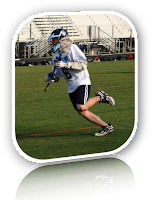 It was late in the third quarter and my son, a 17 year old mid-fielder, was racing to pick up a loose ball. He saw an opponent angling for the ball and had the advantage on him but didn’t see a second one racing in from a sharp angle. Just as he bent over to scoop up the ball the unseen player tried to check my son in the shoulder to knock him off balance but missed and struck him hard on the left side of his helmet with his stick. The ref did not see the blow and play continued. My son rolled on the ground and popped right back up but didn’t look quite right. He stayed in the game but from the stands we could see that he was not running very well. He also was crouching over a bit once he was positioned. I thought maybe he had gotten the wind knocked out of him. He stayed in for another minute or so as the ball moved the length of the field then came out when the next mid-field line came in. As we sat up in the stands we were wondered if our son was okay because he didn’t return to the game. The game ran late and we were home waiting for my son to get back from the school in his own car. The phone rang and it was one of his coaches, telling us that my son had apparently suffered a concussion and that they did not want him to drive himself home. The athletic trainers and coaches at our school are outstanding and followed all the right procedures in ensuring that my son was being monitored properly. When I got to the school my son looked fine, though he was not his usual self. He normally has an easy smile but his look was very serious as he described what happened when the opposing player struck his helmet. First he said he heard an incredibly loud roar, as though a peal of thunder was going off inside his helmet. He also immediately began to see swirling images in his right eye. He felt dazed and had a pretty bad headache though he had never blacked out. The school’s athletic trainer recommended that we take him to a doctor either now or first thing in the morning (it was now nearly 10pm). Having experienced concussions before with him my concern got the better of me and I drove him to our local hospital. The ER doctor examined him pretty quickly and since his headache seemed to be getting worse ordered a CT Scan for him. They generally are looking for internal bleeding and the CT Scan is a good tool for determining if they need to conduct emergency surgery to relieve pressure from building on the patient’s brain. Fortunately his scan came back clean; no obvious damage. The ER doctor told me to check on him every 3 hours for the next day, waking him up to see if he was still lucid and that the pain was not getting worse, a sign they may have missed something on the CT Scan. Later that morning I took him to his regular doctor. By 10am he was actually feeling pretty good; there was no headache unless he shook his head quickly (Don’t do that son!). The doctor told him that he needed to stop all physical exertion until all of the signs of the concussion had gone away completely and then from that point we would wait another week before he would be eligible to play again. All things considered, this went about as well as it can go for a concussion. The reason I’m writing this blog post is because I’m hoping that if you have kids of your own and they play sports or even have a highly active life that includes bumps and bruises you take a couple of minutes and learn about concussions and their treatment. My own athletic adventures as a kid were usually punctuated by phrases like "Rub some dirt in it" and "Come on kid, you’re ok, toughen up". It was just the way things were. Even now you see TV shows and movies where someone will knock a person out with a quick blow to the back of the skull. The victim will then magically awake later, rub the back of their head for a second and then move on as though nothing happened. Take this perspective into the modern age of high school sports. Many kids on successful varsity programs train nearly year round, attending camps, playing in tournaments or participating in off-season workout programs. Throw in a dose of parents with competitive backgrounds that want to see their kids succeed and many kids and parents will push hard to keep their kid in the game. What’s actually happening inside the skull during a concussion is that the brain is twisting, creating torque that can lead to unconsciousness. In addition the brain can bump against the inside of the skull and cause bruises to the brain itself. The CDC estimates that this happens nearly 3.8 million times a year in the US for sports and recreation activities. It’s critical that as a parent you be able to separate yourself from the desire to see your son or daughter keep playing the sport they love so much and ensure that if they did get a concussion that you get involved. Read through some of the excellent materials the CDC provides on detecting concussions and if you are in doubt take your child to a doctor immediately. Sounds a little over-cautious? Perhaps. Of course there is the story of little Morgan McCraken, whose parents got her to the hospital just in time to save her life. Then there’s the story of High School football player Max Conradt’s multiple concussions and what happened to his life. My goal is not to frighten you as a parent about yet another thing that can harm your child. Instead my hope is that you’ll take a couple of minutes and learn what to look for if your child suffers a head injury. Serious injury is very easy to prevent if you know what to look for and that knowledge is critical if your child plays a contact sport.